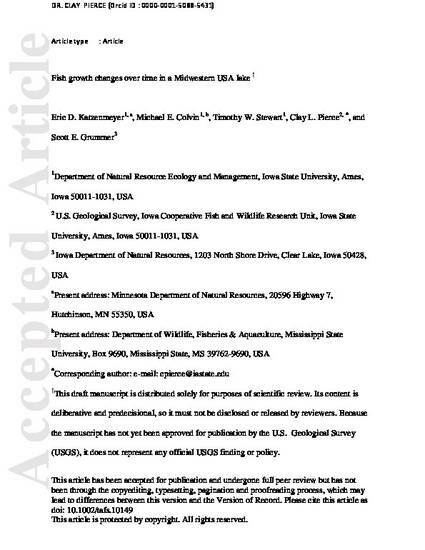 Growth of Walleye Sander vitreus, Yellow Bass Morone mississippiensis, Common Carp Cyprinus carpio, and Black Bullhead Ameiurus melas was assessed in Clear Lake, Iowa, USA, over several decades and in relation to environmental variables. Growth of Common Carp was positively correlated with phytoplankton concentration. Recent Black Bullhead growth was faster than in the 1950s and 1990s, which may be a consequence of their recent decline in abundance. Growth of Common Carp and Yellow Bass was faster in the 1940s than in more recent time periods. Relative to their entire range, Common Carp first year growth was below average whereas length at later ages was above average. Walleye relative growth showed a similar pattern. The large changes in growth over several decades suggest that as the Clear Lake ecosystem continues to change, growth rates of its important fish species are also likely to continue changing. This is a manuscript of an article published as Katzenmeyer, Eric D., Michael E. Colvin, Timothy W. Stewart, Clay L. Pierce, and Scott E. Grummer. "Fish growth changes over time in a Midwestern USA lake." Transactions of the American Fisheries Society (2019). doi: 10.1002/tafs.10149.